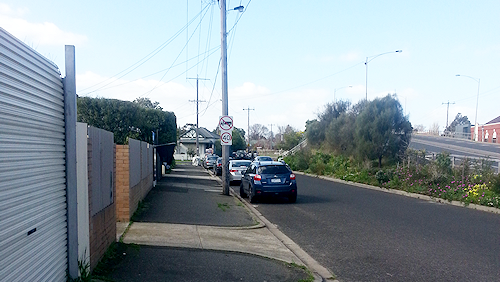 On Saturday I attended an auction at 70 Somerville Road in Yarraville. Somerville Road is one of Yarraville’s top four busy roads and it runs east/west right through Yarraville and out past West Footscray to Sunshine. Despite the fact that it’s a busy road, this stretch boasts a truck curfew during the evenings and on weekends. This is one of the local council’s best efforts to quieten down and make the area as safe as possible for the many residents who are all enjoying the two villages that sit either side of the main road; Yarraville and Seddon. 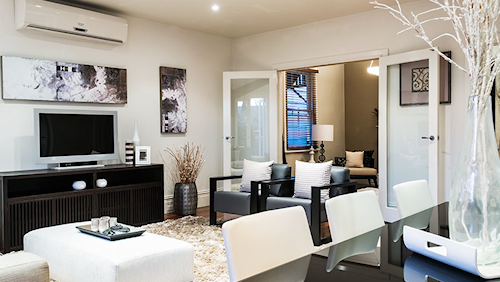 Like all popular hotspots that have emerged in recent years, the locals have rallied the trucks assertively and the once-industrialised area is now experiencing high buyer demand and has exhibited house sale prices exceeding the million dollar mark on a regular basis. It’s fair to use the term re-gentrified when it comes to this little popular hotspot. Today’s auction took into account the nature of the road and the effect that incessant traffic can have. The boys from Village Real Estate Seddon invited everyone out to the rear courtyard of the property in the sanctity and security of what they’d termed “Village Oasis” throughout their campaign. Her friendly reference to the team at Village Real Estate was appropriate because they have embarked on this relaxed and informal style since establishing their business just eight months ago. The house was destined to surprise everyone from the beginning. Firstly, being a 4BR, beautifully renovated period house, it sits within a specialised area of the market as a larger family home. But converse to this valuable attribute, it is a one-bathroom property on a tight allotment of land. Most families who gravitate to 4BR properties prefer a yard and an ensuite, so I knew that the target market would most likely be downsizers or busy professionals who cared little for land. The main road though – that was the mystery. Main roads affect different buyers in different ways. For those who imagined themselves strolling through the front gate, disappearing behind the private hedges and being engulfed by the stunning period features of this gorgeous home, rationalising away the issue of a main road address could be quite easy. In this case, that appears to be exactly what happened to the three bidders; two professional couples and the empty-nesters. The rest of the crowd was made up of interested locals who wondered what this stunner would sell for, friends of both the bidders and owners, and a handful of people who had been tracking the campaign eagerly while enjoying perusing the internal detail and decor. The home had been so lovingly restored to its former glory in the front original part, and it blended almost seamlessly with a clear ‘old meets new’ transition into a fresh, well-lit, open plan living area which provided a decked sanctuary beyond the French doors. We all huddled on the deck where the auction was held. Only after the auctioneer read out the auction rules and pointed out where to find Yarraville’s best coffee on nearby Gamon Street, the bidding commenced, fast and furious between three buyers (one represented by myself), and the property was secured at the finale by the empty-nester couple who were determined that this beautiful surprise package was to be theirs. So what IS it about Yarraville that could tempt multiple buyers to stretch above $800,000 for a property like this on a main road? Proximity to the city (7km) and fabulous transport in and out of the city (just five stops to Southern Cross on two train lines) cannot be overlooked. However, the REAL lures are the two beautiful and unique little villages which sit side by side, hidden away from the truck routes and the western arterials. Locals love leaving the car at home and strolling down to the cafes, parks and shops… and who wouldn’t? 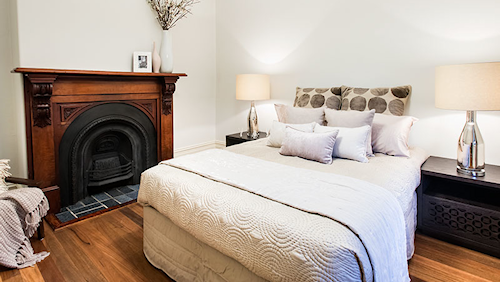 The tight little streets are lined with turn-of-the-century period homes which are lovingly restored (as this one has been) and those who live amongst it all are particularly house proud. And before we get hung up about a figure of this magnitude for a main road location, we have to remind ourselves that a period Victorian four bedroom home 7km to the EAST of Melbourne would be at LEAST double this figure. The $835,000 result for a property which could ordinarily be described by some as compromised was a fitting representation of the way in which buyers WILL accept a compromise to achieve their dream home criteria. With location being everything, some could argue that $835,000 is a very high result for a 300 sqm property on Somerville Road, but what can’t be argued is that a beautiful 4BR Victorian era home within easy walking distance of two great little villages, multiple parks and two stations WILL defend its own value in the face of the main road critics. Great article Cate. We really are lucky living in such a great area which is so vibrant and has a wonderful community vibe . I think you summed it up perfectly. Who wouldn’t want to live here !